A female patient in her late 50’s with acute myeloid leukemia was referred to Loyola. She was neutropenic at presentation and had a recent onset of fever of unknown origin. Neutropenia and fever are frequent occurrences in cancer patients undergoing chemotherapy for hemotologic diseases. A chest radiograph was ordered to rule out pneumonia, one of the most frequently suspected causes, along with infected lines, sinus disease and urinary tract disease. The radiographic images were acquired with FujiFilm’s FDR AcSelerate digital radiography system with dual energy subtraction (DES). 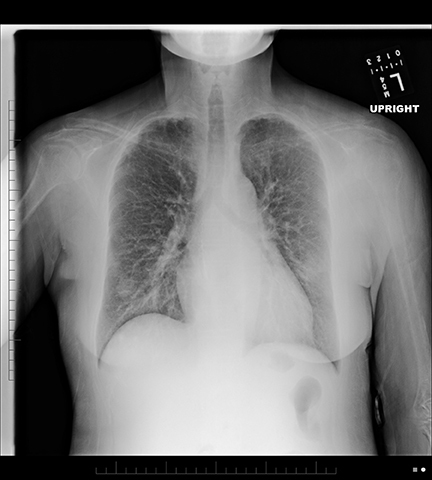 The standard PA view suggested a vague ground glass opacity in the mid-left lung, which is not appreciated on the lateral view. No other significant abnormalities were seen. The cardiac silhouette was at the upper limits of normal. The central line was in good position. There was no pleural effusion, no pneumothorax, and no other parenchymal opacities (Figure 1). 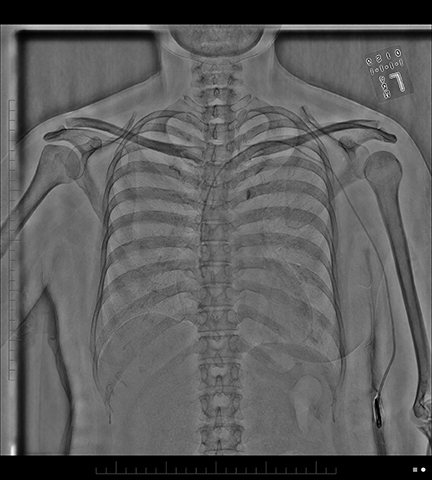 When DES is applied to this standard image to subtract bones, a round opacity in the left lung and a smaller similar opacity in the right lower lung are visible (Figure 1). 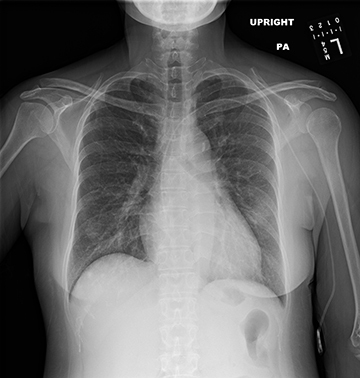 An ill-defined opacity can also be seen right above the diaphragm. 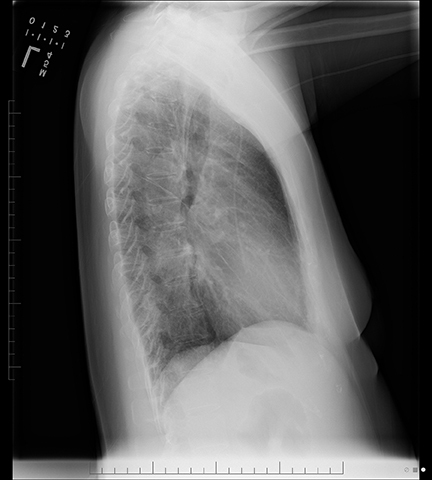 This opacity is smaller but visually more superior, almost immediately underneath and slightly to the right of the opacity in the right lower lung. The subtracted view showed at least three foci of disease in the lungs. Even in retrospect, these are hard to appreciate on the standard view. An astute radiologist may suspect that something is occurring in the right lung, but could have easily discarded it as a summation artifact because it overlies the anterior arch of the rib. providing justification for additional workup to identify the opportunistic infectious agent. Additionally, when viewing the subtracted image, a very sharp demarcation of the mediastinal structures could be seen. Fujifilm’s unique Multi-Stage Registration (MSR) software functionality has intelligently corrected and compensated for breathing and vascular pulsatility artifacts that are typically characteristic of standard non-motion corrected DES. Multifocal bilateral pneumonias. This is a typical and worrisome diagnosis for an immunocompromised patient with netropenic fever. 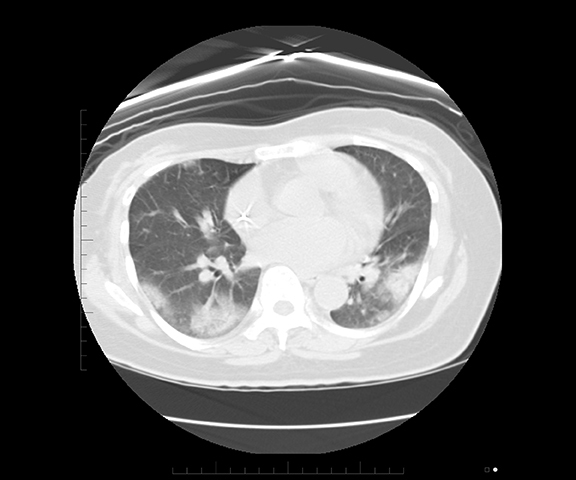 A chest CT exam performed several days later confirmed this diagnosis (Figure 2). DES is a technology that has been utilized for over 20 years. It improves the ability to detect thoracic abnormalities that may be subtle or obscured by overlying skeletal structures on a standard radiograph. Pulmonary nodules located in areas like lung apices and between the clavicles and the hila are notoriously difficult to detect due to numerous superimposed bony structures. In addition, DES is designed to reliably identify calcium, therefore increasing the ability to discriminate calcified versus non-calcified pulmonary lesions. This capability helps increase the diagnostic accuracy of a benign versus non-benign lesion, as well as increasing sensitivity for the detection of pulmonary abnormalities. DES imaging also helps to better identify bone and pleural masses, to detect tracheal narrowing and airway disease, and to appreciate hilar and mediastinal pathology. It also provides better visualization of catheters and stents. The technique uses two sequential exposures at two different energy levels, which increases the amount of data available. However, this method exposes the technology to the risk of potential motion misregistrations between the two different exposures, which in turn can cause artifacts generated by the movement of the heart and the great vessels. The combination of Fujifilm’s MSR software and Patient Size Compensation software optimizes and clarifies over- or underpenetrated areas of the entire image. Fuji’s Advanced Noise Reduction functionality produces a very crisp image free of artifacts. MSR is particularly helpful in regions that are closest to the heart, to the great vessels, and to the diaphragm. In this particular case, the ill-defined opacity in the left lung was adjacent to the lateral wall of the ventricle, an area where the greatest motion artifacts were frequently encountered with the earlier generations of DES. The addition of DES images to a chest radiograph revealed abnormalities — in this case multifocal pneumonia — that were not easy to visualize on standard view images. Because they were identified, therapy could be tailored to the specific opportunistic infectious agent once it was isolated. Dual energy subtraction identifies multiple pneumonias. Appl Radiol.